Speed Bumps are safe and easy for one person to transport and install. Unimat traffic products are high quality and will help maintained schools, parking lots and roads safe, we sell the best speed bump kits in the market at a very low price. Unimat speed bumps are a great way to instantly calm and reduce vehicle traffic speed in a specified location for a temporary period. We are experts in speed bumps, call us to advise you in this area, our products can be removable and are designed exclusively to make easy to calm traffic during certain hours near school yards and playgrounds or during community events and fairs. Maintain a safe pedestrian environment by slowing down vehicle traffic with our Speed Bumps. 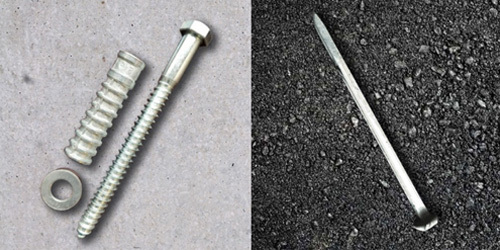 Our prices are the lowest in the market and they include the hardware, speed bump can permanently be installed on asphalt or concrete using its pre-drilled countersink mounting holes. Maintain a safe pedestrian environment by slowing down vehicle traffic with our great 6’ heavy-duty economy speed bumps. Our products will give you total satisfaction and your roads will be safe and people as well, areas like parking lots and much more will be protected. 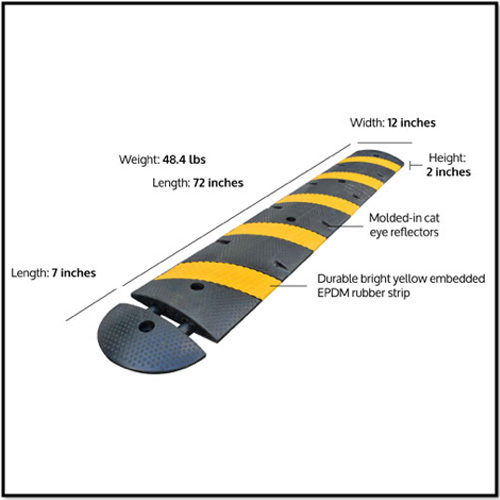 Unimat plastic traffic bumps have molded reflective tape and include cat’s eye reflectors that will increase visibility during the day and night. Speed bumps are used in areas where vehicles need to proceed at much slower speeds, like school zones, public parks, parking buildings, private condominiums and many others. Plastic speed bumps have become the traffic control tool of choice for many of our customers because they are extremely simple install. We offer a variety of sizes with high quality and excellent durability. Our plastic speed bumps have many benefits, we have all products available in stocks and ready to ship right away! Places where speed bumps can be used! Speed bumps can be located in many different area, they will help maintained schools, parking lots and roads safe, also outside schools, community centers, public areas where more vulnerable people might be at risk, they can be placed in addition in residential areas where families and other at-risk people may often be walking, these products are perfect for zones where cars often break a residential speed limit. Speed bumps are great also for indoor and outdoor car parking spaces where a high volume of usually slow-moving vehicles are at risk of collisions with those breaking the speed limit. Our products can be removable and are designed exclusively to make easy to calm traffic during certain hours near school yards and playgrounds or during community events and fairs. We include hardware in our prices! We are the only company in the industry to offer such a great deal. Call us today for a quote, we offer discount for large quantities and special pricing for distributors.